John Richards sucked in the Wembley atmosphere once more yesterday - and savoured the memories of League Cup finals past. Wolves Heroes' co-owner was among the packed crowd as a Football League guest for Manchester United's thrilling victory over Southampton and was naturally stirred by his recollections of the same stage 43 and 37 years ago. 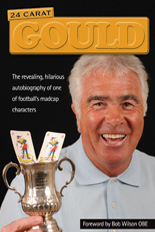 Little did we know when we featured Brian Owen at great length on this site five years ago next month that we would one day have the perfect tool with which to research his amazing life in football. The long-time coach, physio and occasional Wolves first-team player was already more than half a century into his career when we encountered him as an engaging, informative and fascinating interviewee on the other end of the line. FA Cup heroics over, Wolves are back in Championship action this weekend, with their season still having plenty of important ground to run. Ignacio del Valle Ruiz, a football 'freak' with a soft spot for the club, is one of the founders of FootballPredictions.com and is responsible for the creative part of the website. He now has his say on Molinux matters over the next two and a half months. Wolves Heroes have been saddened to hear of the passing-away of Les Cocker, one of the surviving members of the Wolves side who made spectacular FA Youth Cup glory almost 60 years ago. Les, 77, had been suffering from dementia but died peacefully in his sleep at the home in Newport, Shropshire, he shared with wife Wendy. Wolves Were Lucky To Oldham! Ken Knighton couldn't have been happier when the FA Cup draw 50 years ago this winter pitched him into combat against Wolves. The young full-back had left Molineux only two months earlier for what he calls the 'princely sum of £12,000', so the chance to face his former club with Third Division Oldham in a third-round tie was an opportunity to remind Ronnie Allen and others what he could still do. Think of the famous Scottish right-halves over the decades. I am thinking back to those times when the term would instantly conjure up thoughts of a tough-tackling grafter linking defence to attack with power and verve. Bobby Murdoch would come to mind. Certainly Billy Bremner and Paddy Crerand. And, for many, the image would be one of Graeme Souness. Well, Wolves had a young right-half good enough to keep the ex-Liverpool star out of a Scotland no 4 shirt. His name: Doug Devlin. 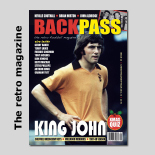 Tinged though it is with sadness, the outstanding latest issue of Backpass is as strong as ever on Wolves content. The magazine was close to going to press in the first half of last month when the news of Graham Taylor's passing prompted a rejig. As a result, the former manager's photo now appears on the front cover as a way into four pages of tribute to him. It was between the fourth and fifth-round weekends of the 2014-15 FA Cup that Rachael Heyhoe Flint spoke with such feeling and humour at the funeral of Sir Jack Hayward - a man she revered so much, she thought he would live forever. Those who knew Rachael probably assumed she was blessed with the same 'immortality' gene as her dearest friend. She was always on the go, getting things done for the common good, fussing around to make sure people were okay; a little bundle of constructive energy. As a former salesman in the brewery trade, Steve Daley is used to spending time behind bars. Not the sort that he has seen more of in recent months, though. Not content with after-dinner speaking, co-commentating on Wolves games for BBC WM and organising a highly successful annual charity golf day, British football's one-time record buy is now taking his motivational addresses around the prison circuit. Tuesday, January 3: We are grateful to Glyne Wetton for informing us that Jimmy Mullen's widow Joan is still going strong in her mid-90s, virtually 30 years on from when Jimmy became the first member of Wolves' 1949 FA Cup final team to pass away.